In a large food processor (use “S” blade) process the nuts, flax, and 3/4 cup coconut flakes until crumbly. Add in the dates, coconut oil, vanilla and sea salt and process again until a consistent sticky batter is formed. 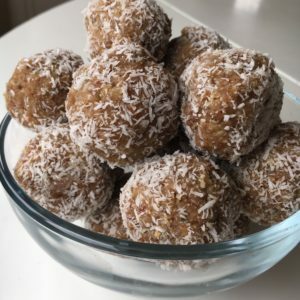 Sprinkle bites with remaining 1/4 cup coconut flakes. Place bites in freezer to set for 1-2 hours before serving. I like to store mine in the freezer and remove whenever we want them for a snack. Allow to thaw for 15-20 minutes before eating. Perfect snacks for flights and road trips!